Advertising and informing is necessary to inform the users about your services, products and also your working hours or other events you are preparing fo your users. 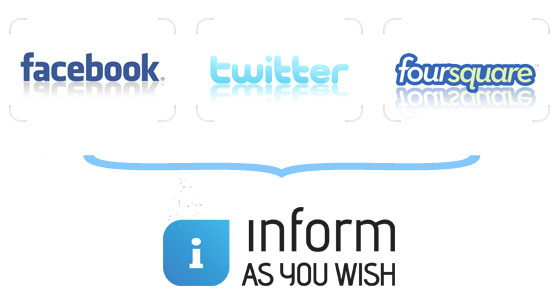 But InformAsYouWish is so much more. It is more than adevrtising, more than informing, more than traditional digital signage. It dares you to take a step forward. 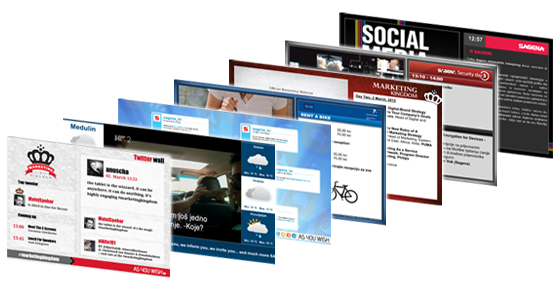 Why have traditional digital signage if you can have InformAsYouWish? Have fun and animate your users with interactive marketing campains, integrate digital signage with social networks, enable your users to fall in love with your brand even more, award them through prize games combining social networks, digital signage and mobile phones. Dare to take a step forward and create marketing campaigns that will turn the point of physical contact between the user and your brand into a fun play-room. InformAsYouWish enables you to display service information, such as weather forecast, road conditions, exchange rates, etc. System is extremely flexible and allows quick and easy adjustment to your needs and your space.